We are so excited to be participating in Silicon Valley Gives on Tuesday, May 5th! We will be joining with the Silicon Valley Community Foundation and other local non-profit organizations for 24 hours of giving right here in our own community. And the best news is that Namaste Foundation will be matching donations to The Art of Yoga Project – dollar for dollar – up to a total of $10,000 during this very special event. So your donation will count twice as much! 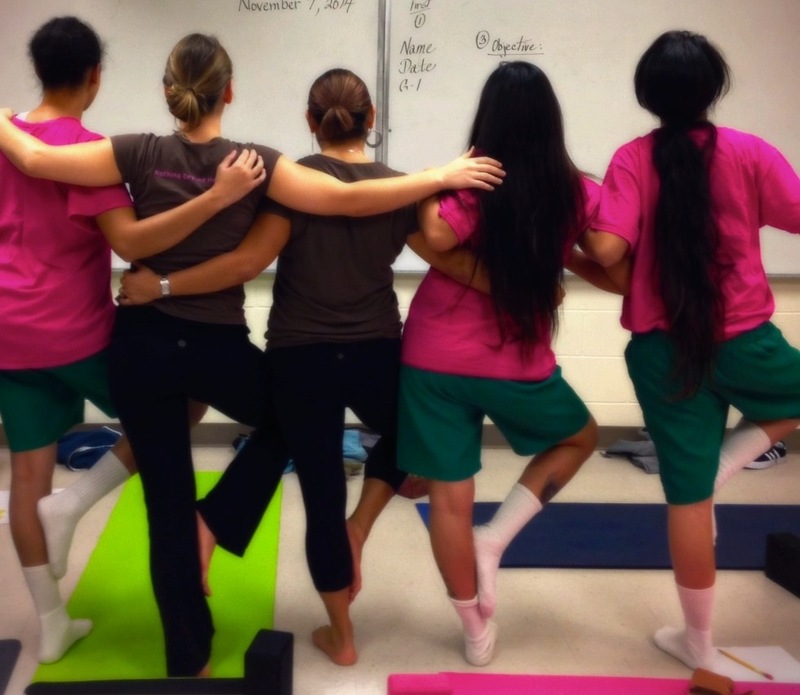 Please take a minute to show your support for The Art of Yoga Project’s extraordinary work with at-risk, exploited and incarcerated teen girls. Your donations make it possible for us to deliver yoga and creative arts programming to 700 girls annually in San Francisco, Santa Clara and San Mateo Counties. You can schedule your donation right now so you won’t forget! Please help us spread the word by forwarding this email to your friends. Click here to schedule a donation today. A HUGE thank you to all of our supporters! 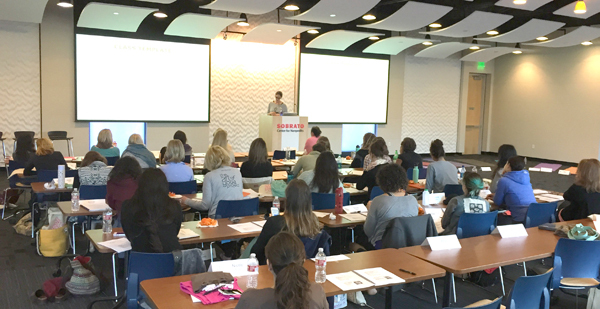 Lisa Pedersen, AYP Executive Director, read those words to 42 women last Friday evening as we kicked off our 9th annual training “Using Yoga and Art to Empower At-Risk and Exploited Teen Girls.” We start each of our trainings this way, reminding participants why we are there and thanking them for their intention to serve. I felt it was our best training ever and our leadership team agreed. Three things stood out for me this year: Professionalism, Depth, and Spirit. 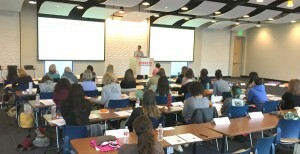 Sarah Barnard presenting at the 2015 training. Professionalism: A big shout-out to the Sobrato Center for Nonprofits for hosting us in their beautiful Shoreway Conference room. 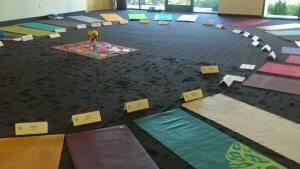 It allowed us to have desks and tables, as well as big screen media AND space for our large circle of yoga mats. 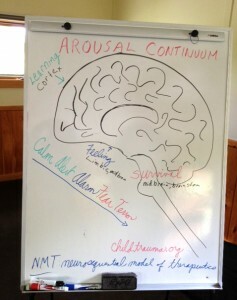 This provided our participants a variety of ways to take in information—didactic to somatosensory! Depth: Each year our content evolves, grows and clarifies. From our new state-of-the-art AYP Trauma Toolkit, to safety, communication, cultural humility, research, commercial sexual exploitation of children (CSEC), self-care, and trouble-shooting, this year we dove even deeper than ever before! Participants also took part in a sample yoga and creative arts class themed Honoring the Feminine. Following is a tribute from our Founder Mary Lynn Fitton to our teachers that work with us to bring this amazing program to at-risk, exploited and incarcerated teen girls. I am often asked what I enjoy most about our work at The Art of Yoga Project. There are so many things! At the top of the list is the way we all come together in support of these unique and wonderful girls. And what really moves me is how we care for each other in the process. Can you feel the GRATITUDE, the SUPPORT, the LOVE and RESPECT between you?! I hope so because I feel it for each and every one of you. When I read these words I see and feel us together. All across this work, I see us leaning on each other as we bear witness to the pain our girls endure. I see us linking arms to provide strength for the girls to draw upon. And I feel us in a big virtual-embrace celebrating our successes big and small. You are certainly rockin my world! Join us and help paint a brighter future for at-risk girls in our community. All proceeds support The Art of Yoga Project’s work to end the cycle of violence and victimization for girls in the juvenile justice system. to buy your tickets online. 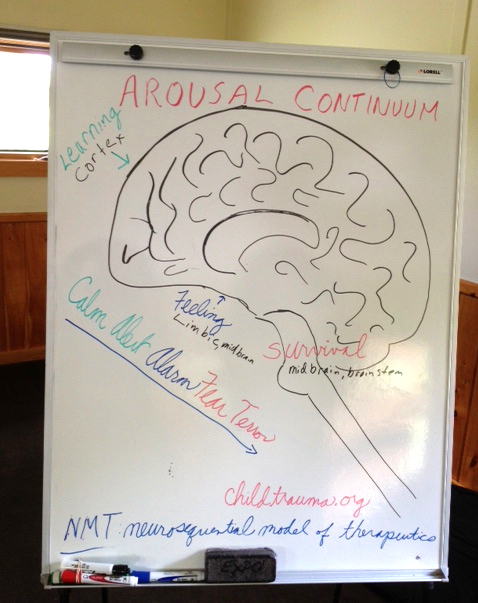 By Mary Lynn Fitton, from the Yoga Service Conference at the Omega Institute in New York, May 2014. I am once again awed by the power of intention. Late last Friday afternoon, I gathered with fellow faculty members to connect and set the tone for this year’s Yoga Service Conference—the third annual. Jenn Cohen Harper, board member and tireless conference organizer, reminded us of our purpose in being there—to welcome, embrace, educate, assist and encourage other individuals and organizations on this path to serve the underserved. I looked around the room and felt a surge of inspiration of how our community had grown. This year was no exception. It was rich with learning and connection. I listened to a panel on diversity and social justice with Hala Khouri, Nikki Meyers and Teo Drake who told us that in this work we had to be willing “to have our hearts broken” and that it is really our response to situations that matters most. I was reminded to take always a breath before speaking to wait for “wisdom to knock on the door.” I heard Kelly McGonigal give us the latest research on stress and resilience. I presented a Breakout Session with Leslie Booker and Bob Altman titled “When Things Go Wrong” and shared The Art of Yoga Project’s latest knowledge in neuroscience and trauma as the framework for understanding brain-based behavior challenges in our yoga classes. But it was the one-on-one conversations that stood out as highlights for me. I connected with leaders who serve veterans, children and seniors in under-resourced communities, homeless individuals, people with cancer and eating disorders and (like The Art of Yoga Project) incarcerated and at-risk youth. 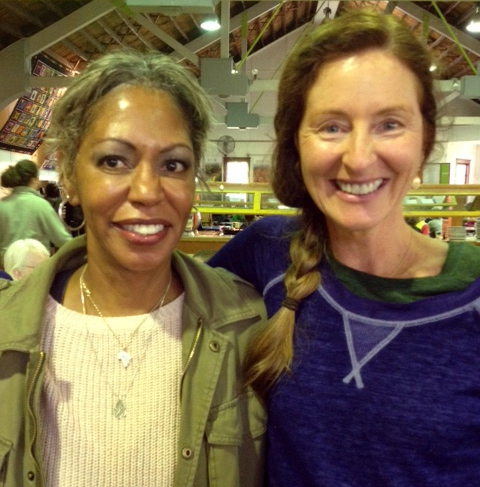 I met Heidi who wants to bring yoga to end the misery of generational poverty. 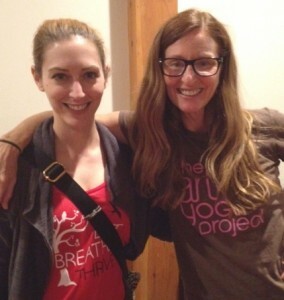 I met Carrie who wants to bring yoga to veterans because her own partner suffered from PTSD from the Iraq war. I met Sara, who works with boys and girls with eating disorders (and also knows my friend, Sally, from high school!!) But who really astonished me was Cheryl. Cheryl saw AYP featured in the documentary YogaWoman and was so inspired that she came all the way to Omega from Singapore to meet us so she could bring our Yoga and Creative Arts Curriculum to girls in her community! And what better spot to find us than the Omega Institute, a pastoral setting north of New York City, which claims to be “more than simply a place, but a global community that awakens the best in the human spirit and cultivates the extraordinary potential that exists in us all.” I couldn’t agree more! Thank you, Omega. Thank you, fellow YSC members and faculty and thank you, conference participants. You are my Yoga Service Community and your passion, honesty and commitment to this work moves me beyond words. Until next year… Namaste. From 1994 to 2003, the juvenile arrest rate for aggravated assault increased by 17% for girls and declined 15% for boys. Females accounted for 59% of juvenile arrests for running away and 69% of arrests for prostitution. Among female delinquents, an estimated 70-90% have a history of sexual abuse. Balance means for me to be drama free. When I think of balance relationships come to my mind being 50/50 and everything is even. Meeting halfway. If there is one thing that yoga does for me that is good, it\’s that it makes me feel. And I know I need to do that. I usually see things black and white. But after I do yoga I feel like a new person and I look at things in new ways. I see there is more than just yes or no, more than one choice, more than one path. I like this idea because so far the path I’ve chosen hasn’t been great. I’m ready for a new one. What is balance? Both parts are equal, one not bigger nor heavier than the other. Both come together in peace & serenity. I see myself getting out of juvenile hall. I see myself getting a diploma. When I am focused I am at ease. For instance when I draw or write, I block everything out and it’s just me in a whole other world. My world. I breathe more easyer (sic) and just focus. I put my feet flat on the floor and feel the earth. I see myself successful because I’m confident. I can visualizing myself graduating high school, going to college, getting my masters in law and having a steady job and a house for me and my daughter when I get out someday. Thank you for the amazing work you do. And for the support you’ve provided for the young women at the center… Keep doing what you do. I just wish you all the best of luck. It’s really important work. We definitely see the benefits of having you guys here! The meditation really met the girls where they needed to be supported. It was a very productive day at the school. The girls were quick to join the circle and get ready to begin our session. They loved the art project and are really starting to open up and share more about themselves with us. The mood in class dramatically shifted by the end. The class left everyone in a much more positive mood. There was the most beautiful focused Savasana imaginable, brought to you by Sarah\’s wonderful guided meditation. The [AYP] staff are great. They are role-models for our staff and the girls. They are always cordial and they understand safety and security. When we ended, nearly every girl said thank you for the class…it seemed the gratitude had really rubbed off by the end of class. Today the girls taught their own yoga class. It was a great experience for me to see my students leading and supporting others. They were so engaged and conscientious. They even helped me try a new pose. I went to Girls Court last Wednesday and realized 3 of the girls there had current yoga mentors—one of which told the judge she loved yoga, that it calmed her and made feel better. And yesterday, my own new mentee told me the same. Nora led them through a beautiful practice! Starting with the breath. Some girls were on their belly some seated, all were engaged and you could see them taking deep breaths. We moved from breath work on the floor to standing side stretches and a few sun salutations and ended with some seated stretches and a peaceful savasana. The Art of Yoga Project focuses on early intervention to help marginalized and justice-involved girls prepare for a positive future. We are leaders in the treatment and rehabilitation of justice-involved girls by offering gender-responsive, trauma-informed, culturally-responsive, and strengths-based programming. Our mission is to lead at-risk, exploited and incarcerated girls toward accountability to self, others, and community by providing practical tools to effect behavioral change. We send specially trained yoga teachers, art therapists, creative arts and writing educators into facilities to deliver our mindfulness-based curriculum. The Art of Yoga Project is a 501(c)(3) non profit. Tax ID #20-2448697. A special thank you to the Taproot Foundation for its help in developing this web site.